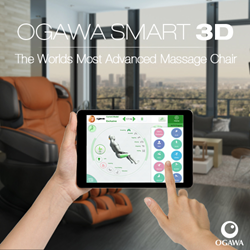 Ogawa World USA releases the first Smart Massage Chair to market with its exclusive tablet navigation and Smart Application. The Smart 3D keeps innovating over time with massage program updates that you can download right to your Samsung Tablet. As new massage techniques become available, you’re Smart 3D will incorporate them. 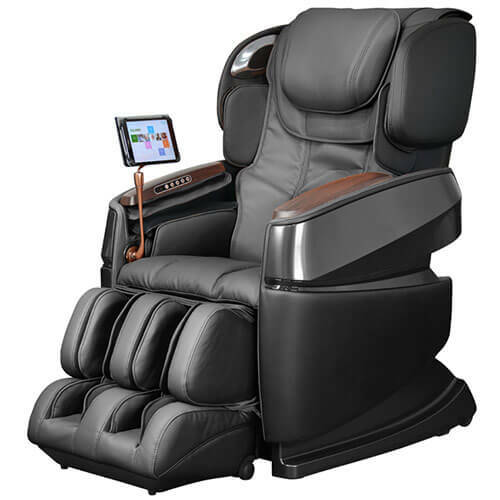 Ogawa World USA introduced the first of its kind Ogawa Smart 3D Massage Chair with its user friendly Samsung tablet and exclusive Smart Application. The Smart 3D combines the best in technological advancement, design, and massage capability for a truly unbeatable massage. Starting each massage with a customized user profile and specialized massage program, each user has a tailored experience unparalleled by any other massage chair. Every aspect of the Smart 3D Massage Chair caters to the user with adjustable dual head 3D massage rollers, unlimited saved user profiles, fully adjustable compression massage, and automatic adjustments for users with longer legs. The chair has 17 different pre-programmed massages ready to use with one touch, including a great Thai Stretching program and the invigorating pressure point style massage known simply as Chinese. The Smart 3D incorporates the weightless feeling of the Zero Gravity position, Heat and Vibration Therapy, and Dual Action Foot Rollers for ultimate relaxation. Add to that Bluetooth Connectivity for enjoying music through the integrated sound system, and the healing effects of Color Light Therapy and they’re checking all of the boxes for both luxury and function. Sophisticated styling starts with the Smart 3D’s silky synthetic leather and sleek design. The chair has a comfortably padded seat and lined air compression chambers to keep users cool and relaxed. The Ogawa line of chairs all stow away their rollers so that the user can stay sitting in the chair comfortably to read a book or take a nap when not being massaged. The wood grain arm panels with integrated Quick Touch Controls look great and provide easy access to frequently used functions like Zero Gravity recline. “Quality and innovation are Ogawa’s focus and the Smart 3D is no exception. With self-diagnostics, the Smart 3D will actually alert technical support if an issue occurs, keeping your chair working at its prime”, says Rick of Ogawa. “The Smart 3D keeps innovating over time with massage program updates that you can download right to your Samsung Tablet. As new massage techniques become available, you’re Smart 3D will incorporate them. This is a chair that’s made to last”, says Rick. Ogawa designed this chair with proprietary Smart Innovations that all work together to create an ideal massage. The chairs Quiet Technology eliminates excess vibration and feedback to make sure the user can slip gently into sleep without disturbance. At the same time, the Smart Sense technology incorporated into the foot rest allow for the perfect amount of pressure for comfortable massage. These sensors also scan the length of the users leg for automatic adjustment for almost any height. Adjustable shoulder air chambers have 3 width settings so that even those with the broadest shoulders are accommodated and the chambers can be rotated up or down for taller or shorter users. The Ogawa Smart 3D is the massage chair of the future. Why wait to try the most advanced massage chair on the market. Feel the Ogawa Difference today. To learn more about Ogawa’s innovative new Smart 3D Massage Chair, visit OgawaWorldUSA.com. Ogawa is an international brand specializing in the design and manufacture of health and wellness products. With a customer first philosophy, their products are both exciting and reliable.